RA Prof. Dr. Stefan Kröll, LL.M. I am the (Co-)Author and (Co-)Editor of several national and international leading publications on arbitration and international sales law. 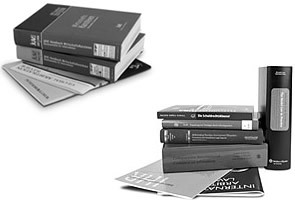 Among them are inter alia Comparative International Commercial Arbitration (with Lew/Mistelis), Arbitration in Germany – The Model Law in Practice (with Böckstiegel/ Nacimiento) and UN Convention on Contracts for the International Sale of Goods – Commentary (with Mistelis/Perales Viscasillas). In addition, I have contributed chapters to numerous books and published more than 100 articles or case reviews in national and international law journals in German and English. The main focus of my publications is on national and international arbitration and on international contract and procedural law. I have moreover published on the German civil, trade and banking law. Besides that, I am a member of the editorial or advisory boards of several national and international journals (Internationales Handelsrecht; International Arbitration Law Review; b-arbitra; Revista Latino-Americana de Derecho Comercial Internacional/Latin American Journal of International Trade; European International Arbitration Review). In my capacity as a National Correspondent for Germany to UNCITRAL I collect German decisions on arbitration and regularly publish English case summaries in the UNCITRAL Clout database. In this context, UNCITRAL has retained me as one of 3 experts for the preparation and the updating of the UNCITRAL Model Law Digest. Prof. Dr. Stefan Kröll, LL.M.